Buying a property on the Costa Blanca will guarantee any purchaser the best that Spain has to offer, and virtually everything that folks usually desire and strive for when making the move to sunny Spain. There is no denying the fact that it is many people’s dream to own a piece of dirt with some mortar on it, preferably situated right next to the beach, or at least close enough to enjoy a perfect view – however you need to be able to afford to pay for this privilege, prime beach front property comes at a price!. This dream has been turned into reality for many property buyers who have chosen the Costa Blanca, especially in the green and mountainous north, where property doesn’t have to be ‘front line’ to offer magnificent views. The 320-days-of-sun guarantee that the Costa Blanca promises has also greatly contributed to the popularity of property in this region of Spain. Some folks rely on the good weather to recover from ill health or to be able to cope with the challenges of an aging body and where better? The area has provided just that for an increasing army of people who have bought Costa Blanca property and made the decision to settle in sunny Spain. Others, especially business persons, have been attracted to the relaxed lifestyle of Spain. 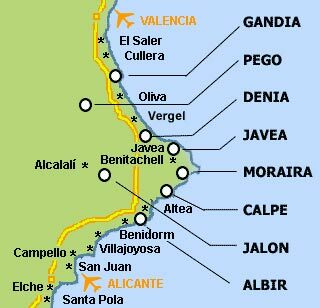 Little wonder that many expat business premises and offices on the Costa Blanca will be found along the beautiful coastlines of Javea and Moraira. Another popular area with the Brits is the beautiful wine growing Jalon Valley where many expats have set up businesses. The fact is that some people are much more productive in a relaxed and easy going atmosphere and many businesses thrive. The unique and unforgettable atmosphere along the Costa Blanca has to be experienced to be believed and appreciated, as no description, verbal or written can do justice to it. The inexpensive but excellent quality restaurants, the fragrant orange and almond groves, the shops, the white sandy beaches, many of which are relatively undiscovered by tourists, enabling one to enjoy them all to themselves. These are but a few of the many seemingly small details that have made Costa Blanca property very popular. Enthusiastic golfers have the choice of property on the exclusive La Sella and Oliva Nova golf courses in the north, or the popular Villamartin & Las Ramblas golf and many more in the flatter, drier south. There are still many ‘value for money’ properties on offer along the coast despite the fact that prices have started to rise again following the recession, all of which have conspired to make the Costa Blanca one of the most popular areas for property purchasers in the whole of Spain. There is still a price difference between the north Costa Blanca and the south which offer very different landscapes. The cheaper property is usually found on the south coasts such as Guardamar, Torrevieja down to San Miguel on the borders of Costa Calida, whilst the north is still slightly more expensive. Whichever you choose, Costa Blanca property can still offer you the best of Spain.